Chamathya Fernando, a recipient of the prestigious Emerging Young Leaders Award, stood before a room of ministers, diplomats, and world leaders on September 15th, 2017, to deliver a speech addressing the importance of democracy, peace, the role of women in maintaining stability, and the importance of youth involvement in her native country of Sri Lanka, and around the world. Joined by her peer and fellow awardee Gharsanay IbnulAmeen of Afghanistan, the young women who both work in female empowerment and education, were two of just three U.S. State Department Exchange Program alumni invited to attend the Community of Democracies Ministerial Conference in Washington, D.C. In the Spring of 2017, Chamathya and Gharsanay initially found themselves in the United States as part of the Emerging Young Leaders Award Program (EYLA), an initiative of the U.S. Department of State’s Bureau of Educational and Cultural Affairs and organized by Legacy International. The program recognizes youth around the world for their efforts to create positive social change in challenging environments. Since 2016, twenty leaders between the ages of 18-24 have been selected by US Embassies worldwide—individuals who represent the power of young people to launch grassroots initiatives to improve their communities. In addition to being honored by the U.S. Department of State for their efforts in building sustainable peace and constructive social change in their communities, the awardees have received stellar training by Legacy International to equip them with the tools needed to measure the impact of their important work, ranging from combating extremism to empowering voices and peace building. The Community of Democracies Conference took place over the weekend of September 15th—the International Day of Democracy. As a day of observance organized by the United Nations, the 2017 International Day of Democracy is centered on the critical need to strengthen democratic institutions to promote peace and stability. 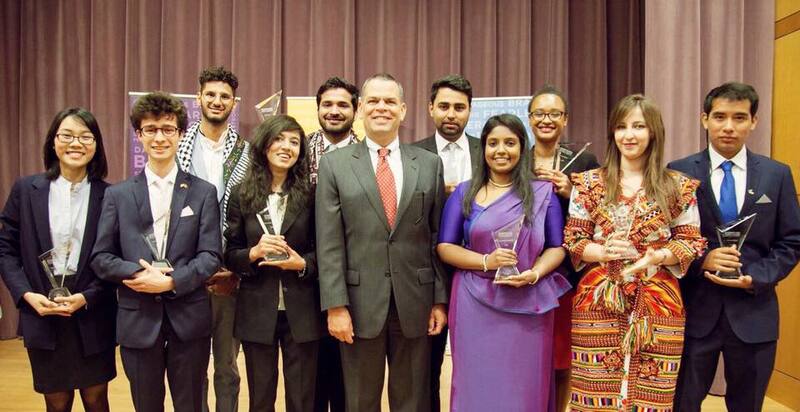 Thus, Chamathya’s call to action through her speech and the work that she, and the twenty other Emerging Young Leaders continue to pursue, has never been more imperative to the sustainability and success of the international community as right now. Yet with immeasurable global challenges coupled with social, cultural, and socio-economic discrepancies, the idea of democracy is often easier explained than implemented. And although many agree with it in theory, effectuating democracy is frequently accompanied by varying complexities. Thinzar Shunlei Yi lives and works in Myanmar and is one of the 20 EYLA participants. She is the Advocacy Coordinator at Action Committee for Democracy Development and President at Yangon Youth Network. 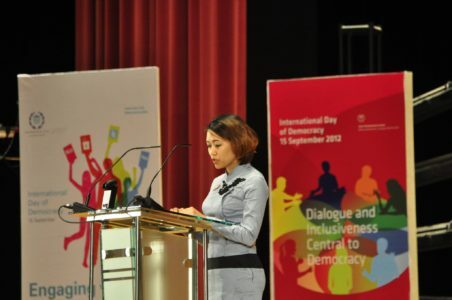 As the crisis in Myanmar has unfolded, Thinzar’s concern has increased, and though she believes that “young people are the key main actors in defending democracy and promoting democracy,” she is acutely aware that the ideals of democracy are not so easily sown in the midst of conflict and instability. Yet Thinzar refuses to give up and continues to be an outspoken and stalwart proponent of what she deems right. Thus, as a representative of the youth in her country, she strives to defend and promote democracy in Myanmar. Self-expression and access to unbiased information are two things that Moisés Alexander Salazar Villa of Peru believes are mandatory for the success of democracy in a country. As another EYLA participant who works in eliminating crime in Peru and has seen, firsthand, the needs in his country, Moisés, like Thinzar, believes that democracy could work, if equal access to information and knowledge were achieved. Though the implementation of what they see as true democracy may still be on the horizon and not actualized in their respective countries, Moisés, Thinzar, Gharsanay and Chamathya work passionately to make sure people are engaged and their governments are acting responsibly—implementing and upholding the principles of democracy.